The Kia Sedona has been completely redesigned for 2016, and they don't even call it a minivan anymore - it's a multi-purpose vehicle (MPV). Its purpose is to blow you away with new streamlined styling in a dazzling array of new models that stretch the imagination and challenge all other carmakers. Call it what you will, but the 2016 Kia Sedona marries SUV design cues with the utility and versatility of a minivan in a way that puts it in a category of its own. This year, the eye-catching Kia Sedona is available in five different trim levels: L, LX, EX, SX and Limited. If you can't find one that strikes your fancy at Cumberland Kia, then something is wrong with your fancy. Come to our state-of-the-art showroom at 1560 Interstate Dr in Cookeville, TN, and one test drive will show you why the new Kia Sedona might just be the best minivan that money can buy. Our customers come from Lebanon, Crossville, Mcminville, Franklin, and Chattanooga, TN, because they know a good deal when they see it. 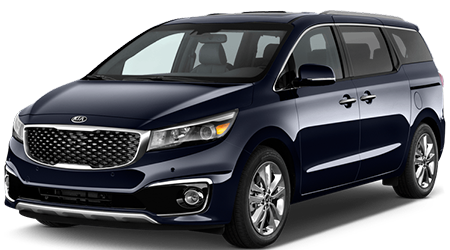 You may not realize it, but one of the main reasons you are attracted to the minivan format is safety, and the 2016 Kia Sedona is one of the safest vehicles around. Of course, you get all the latest active (preventative) safety features like Electronic Stability Control (ESC), Cornering Brake Control (CBC) and Vehicle Stability Management (VSM), but the Kia Sedona really protects you and your family in the event of a collision. You get the most advanced airbags, seat belts and active headrests, and it's all built on a super-safe frame designed with crumple zones to diffuse the impact energy, and made with 55% high-strength steel. Inside, the safety features become invisible, as the 3-point seat belts and front seat pre-tensioners make them feel barely-there and comfortable. If any safety features are missing from the 2016 Kia Sedona, you don't need them. Forget everything you know about minivans. The Kia Sedona is different, especially in the way it handles - magnificently. With the ground clearance of a car, the maneuverability of a motorcycle, and the power of a truck, the Sedona will take you places that other minivans only dream of. The stalwart 3.3L V6 engine is dressed to impress, and the 2016 Kia Sedona leaves other minivans in the dust with a robust 276 hp that harbors plenty of reserve power. Unlike other family vans, the Sedona never strains or shows any signs of weakness when you push it hard. You may be surprised to learn that the new Sedona gets an EPA-rated 22 mpg on the highway, 17 mpg in the city, and 19 mpg combined, which is pretty remarkable for a big boy. The 6-speed automatic transmission powers the front wheels of the Sedona, and the shifting is smooth and quick. But when you cruise the roads in the Kia Sedona, rely on the manual-shift mode to give you the unparalleled satisfaction of engine braking on downhill curves. If you live in Lebanon, Crossville, Mcminville, Franklin, and Chattanooga, TN, or anywhere in Northern TN, and you have a family, you owe it to yourself to check out the new Kia Sedona at Cumberland Kia, where we have just received a large shipment of new Sedonas in all the most popular trim packages, including the top-dog Kia Sedona SX Limited. We are conveniently located at 1560 Interstate Dr in Cookeville, TN, and we would love to see you. Bring the whole family and a selfie stick, because every trip in the 2016 Kia Sedona is an exciting new adventure. See you soon!